We will be telling the story of the Great Race that narrates the travels of the 12 zodiac animals to the Jade Emperor to solidify their place in the Chinese calendar. Each ceramic artist has chosen one animal of the zodiac to represent in clay – their own unique history shapes their contemporary interpretation. The Great Race is the first of four themed exhibits for 2019, a year dedicated to our furry friends, where artists will use anthropomorphism to convey messages about relationships, how we coexist with animals in the wild and in our homes, and the importance of preserving the animal kingdom to maintain the delicate balance of our shared ecosystem. The Great Race we will be telling the story of the Great Race – a short story narrating the travels of the 12 Chinese zodiac animals to the Jade Emperor to solidify their place in the calendar. 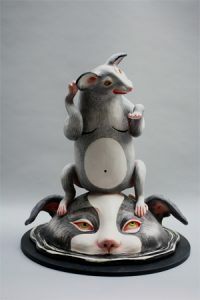 Each ceramic artist has chosen one animal of the zodiac to represent in clay – their own unique history shapes their contemporary interpretation. While the story of the Great Race will be outlined throughout the gallery, each artist will provide information as to why they chose each animal and how it is relevant to contemporary culture. Clay Art Center will be using its exhibition space to understand and celebrate cultural heritage. Concurrent to this exhibition to celebrate Chinese New Year, Clay Art Center is hosting an intimate banquet in our gallery, on Tuesday, February 5. Serving a special meal, our chef will be serving food on dishes created by Nikki Lau (a current CAC artist-in-residence), which guests will take home at the end of the evening. Three artists from the exhibition will give gallery talks during cocktail hour. Animal Instinct, dedicated to our furry friends, is our year-long gallery focus for 2019, exploring the animal kingdom through a series of four core exhibitions and related programming. The exhibits will examine how artists use anthropomorphism to convey messages about relationships, how we coexist with animals in the wild and in our homes, and the importance of preserving the animal kingdom to maintain the delicate balance of our shared ecosystem. The exhibits include: The Great Race, Pots for Pets, The Emotional Animal and Julia Galloway: Endangered Species Project. Clay Art Center was founded in 1957 by Katherine Choy and Henry Okamoto. Unknown to them at the time, Clay Art Center would grow into an 11,000 square foot non-profit art center that delivers programming for professional artists, students, collectors, and the Port Chester community at large.